So the #Rhizo15 challenge has been set, build a learning artefact for the practical rhizomatic guide. What to make of it? I initially wondered about a Thinglink with a whole heap fork-able fun. However, I then thought instead of sending people elsewhere to something to make their own, I would create an artefact that itself can be modified and adjusted in order to suit. Inspired by Dave Cormier’s post from earlier in the year reflecting on the importance of caring, I decided to start a ‘Guide to Caring’. 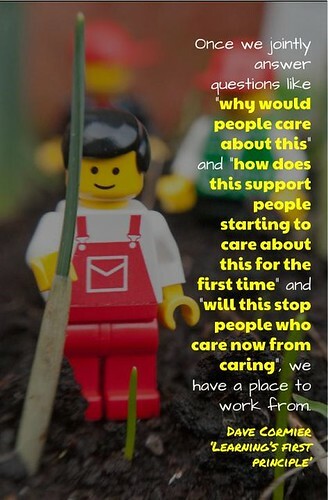 Not caring in the sense of how do I look after someone, but more how we might create the conditions, a community, a culture, that allow others to care. To adapt the resource for your own, go to the following link and make a copy. Caring – A Practical Guide by Aaron Davis is licensed under a Creative Commons Attribution-ShareAlike 4.0 International License.